An other block styled abecedarium is printed in the book "Indian Scripts in India" by Lokesh Chandra, New Delhi 1982, page 60 as a last position of Bon-po scripts. This script is similarly to the block styled letters, due to the fact that the vowel and the "shad " are placed below the preceeding consonant and do not use punctuations marks. 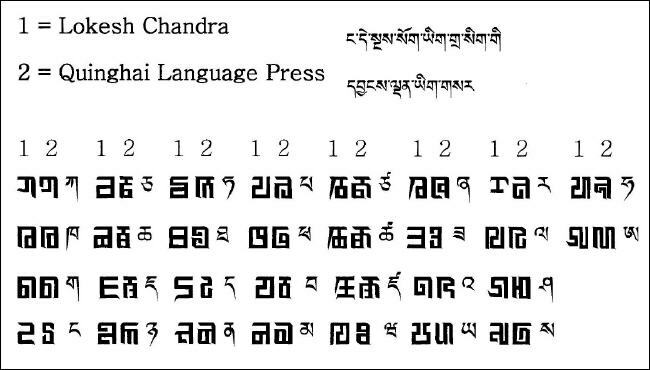 This signs are a decorative script for the "bon mang " in the Bon temples "gsas khang "
I named the ttf.file "Garuda1"
Enclosed find the keyboard mapping für the "Garuda1"
To differentiate between the two block style script I have made a comparison.